VANCOUVER, BC, March 1, 2012. 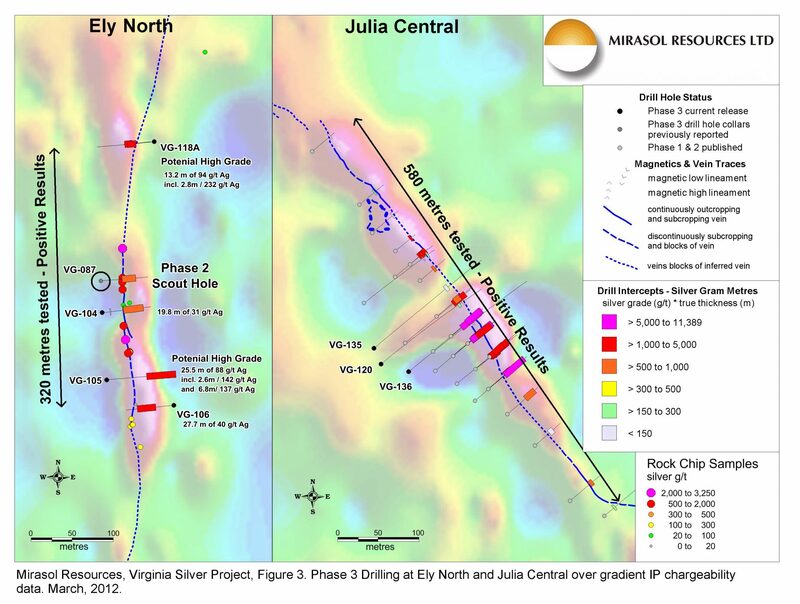 Mirasol Resources Ltd. (TSX-V: MRZ, Frankfurt: M8R) is pleased to announce final assay results for Phase 3 diamond drilling at the 100%-owned Virginia Silver Project, which includes holes drilled at the Ely South, Ely North, Julia Central and Julia South veins. 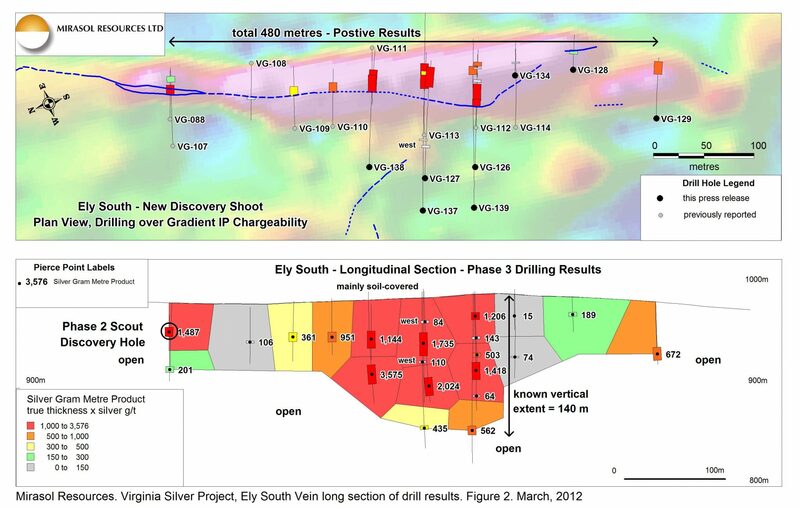 Phase 3 drilling, completed in December 2011, has identified a significant silver-bearing vein shoot at Ely South, has doubled the length of mineralized vein known at Julia South, and indicates a new concealed shoot may exist on the Ely North structure which shows promise for resource potential. Mirasol recently commenced the Phase 4 drill campaign which will focus on expanding known deposits along strike and to depth, and has increased planned metreage to 10,000 metres. The Ely South vein is exposed as a linear train of outcrop and subcrop vein blocks occurring over more than one kilometre. Previously released drill results (news release January 26, 2011) confirms a silver mineralized vein with extensively oxidized wall rock halo, similar to the Julia Vein drilled in Phases 1 and 2. New holes released herein demonstrate an increase in true thickness and silver grades at depth at Ely South, which is clearly shown in holes VG-127 and VG-138. VG-127 intersected 26.9 metres, with an estimated true thickness of 15.0 metres, containing 135 grams per tonne (g/t) silver, which includes 1.19 metres of 1,760 g/t silver. VG-138 contains 28.0 metres with an interpreted true thickness of 18.4 metres, grading 195 g/t silver, including 4.6 metres of 493 g/t silver (Table 1). Notes: All analyses done by Alex Stewart Argentina S. A. laboratory. True widths have been estimated using cross sections of the mineralized intercepts with the geology of the drill hole and surface information and adjacent holes and cross sections. Silver grades have not been capped and are thus “uncut”. Intercepts are calculated at a 30 g/t silver cutoff with no value given to gold or lead. “Included” intercepts are selected so as to show higher grade intervals. Core recovery is the length weighted average (“LWA”) of the intercept quoted. Hole designated with an asterisk * are twins which have been redrilled with the objective of increasing the core recovery. Complete results for original and twin holes are in Appendix A. Phase 3 drilling was undertaken in five principal areas, four of which previously had been tested by a single scout hole (Figure 1). 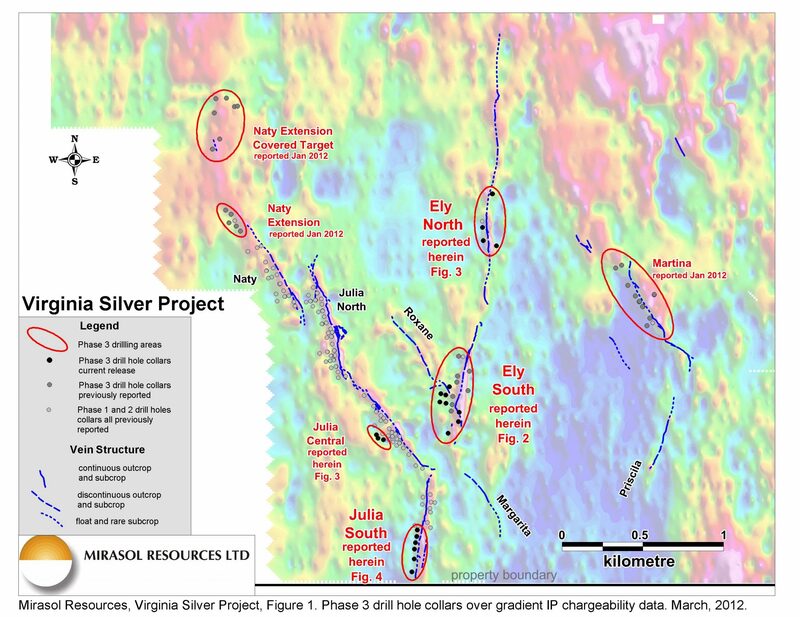 The Ely South vein is manifested as a robust, wide zone of silver mineralization, largely soil-covered at surface, with a strong associated IP chargeability signature which presents an attractive target. Drilling shows that grades and vein thickness are modest near surface but increase down dip, which suggests that the present erosional level of the mineralized shoot is shallow, and that the best mineralization may be preserved at moderate depths below surface. To date, drilling totals 17 holes at Ely South and mineralization extends vertically from surface to a depth of 140 metres, over a strike length of 480 metres, with both dimensions open for expansion (Figure 2, Table 1 and Appendix A for complete assay intersections). In some holes, multiple parallel zones of mineralization are indicated. The character of mineralization in Ely South is strongly oxidized, similar to the Julia and Naty veins, however Ely South lacks strong faulting and is hosted in more competent rock, which yields excellent drill core recoveries. Vein segments which show modest grades near surface, such as below VG-109, 110 and 129, are prime exploration targets. These areas will be tested with the current Phase 4 program. Ely North was previously tested in Phase 2 by a single scout hole VG-087 which intersected a broad, low-grade intersection of 23.45 metres containing 35 g/t silver, but with no higher-grade intervals. In Phase 3, four additional holes were drilled which contained similar broad silver intercepts and two of them also included higher-grade intervals (Figure 2). VG-105 returned (Table 1) a 51.0 metre intercept of estimated 25.5 metres true width containing 88 g/t silver which included two higher grade intervals of 2.6 metres of 142 g/t silver and 6.8 metres of 137 g/t silver. Further north, a single hole, VG-118, was drilled on the inferred vein trend with a coincident IP chargeability anomaly. VG-118 intersected quartz vein material with silver values and a halo of lower grade mineralization, but with moderate core recovery which required twinning to ensure reliability of results. Twin hole VG-118A has very high core recovery (Table 1) and in fact returned higher silver gram-metre product intercepts than the original hole (Appendix A). The Ely North results are very encouraging and will be followed up during the current Phase 4 drill campaign. Ely North mineralization appears similar to the Julia-Naty veins and is oxidized. Three holes were drilled at depth in Julia Central (Figure 3). All three produced intercepts with greater than 30 g/t silver mineralization at about 40 metres beneath the previous deepest drilling (news release Sept. 7, 2011, Fig. 3). The grade and width of the mineralization (Appendix A) appears to be declining in these holes compared to previous results at Julia Central. Potential exists to extend mineralization to the northwest and southeast of the Phase 3 holes, where mineralization has not been tested to depth. 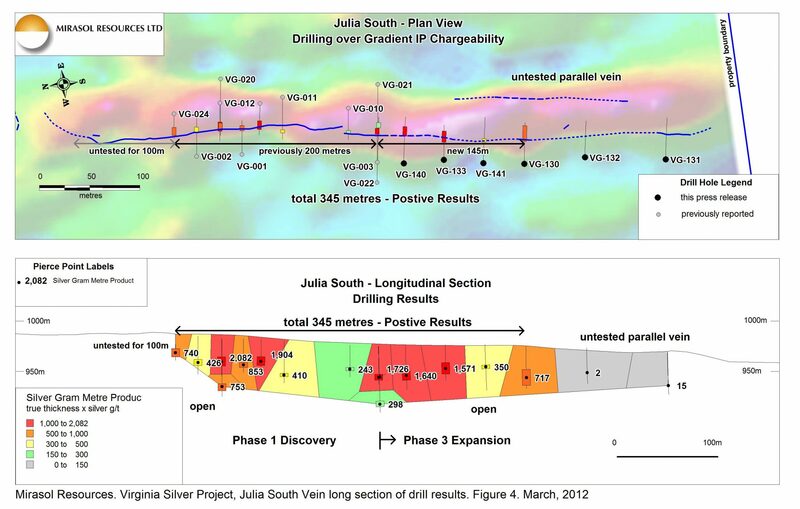 At Julia South, initially four new holes were drilled to extend the outcropping vein tested in Phase 1 (Figure 4). The southern extension of the vein is poorly exposed and largely soil-covered, but the new holes produced encouraging results, thus two additional holes were drilled, which also produced encouraging results. Best holes are characterized by wide intercepts with included higher grade intervals: VG-133 returned 11.1 metres true width of 141 g/t silver, including 0.8 metres of 1,115 g/t silver, and VG-140 returned 8.9 metres true width of 185 g/t silver, including 1.5 metres of 741 g/t silver. These results are comparable to the outcropping Julia South vein, which is a pleasant surprise. Julia South remains open to the north where 100 metres of associated chargeability anomaly remains undrilled. At the south end, the vein appears to split and the eastern branch has not yet been tested over a length of 200 metres. Julia South has been drilled to a depth of 60 metres below surface and remains open at depth. “Mirasol is pleased that new Phase 3 drilling indicates that the Ely South Vein shows potential to develop size and grade which may yield a silver resource. Likewise, positive results from Ely North indicate that it too may have resource potential, and at Julia South that the strike length of known mineralization has been doubled”, stated Mary Little, Mirasol’s president. The oxidized, near-surface nature of the Virginia silver deposits shows potential for definition of high-quality silver mineralization that may be amenable to low cost, open-cut mining techniques. Exploration at the Virginia Project is supervised by Stephen C. Nano, Vice President of Exploration; Timothy Heenan, Exploration Manager; and Paul Lhotka, Principal Geologist who is the Qualified Person under NI 43-101. All technical information for the Company’s projects is obtained and reported under a formal quality assurance and quality control (QA/QC) program. Drill core, rock chip and stream sediment samples are collected under the supervision of Company geologists in accordance with standard industry practice. Samples are dispatched via commercial transport to an ISO 9001:2000-accredited laboratory in Mendoza, Argentina for analysis. Results are routinely examined by an independent geochemist to ensure laboratory performance meets required standards. Hole designated with an asterisk * are twins which have been redrilled with the objective of increasing the core recovery.